Me in action last year. Sweet job. 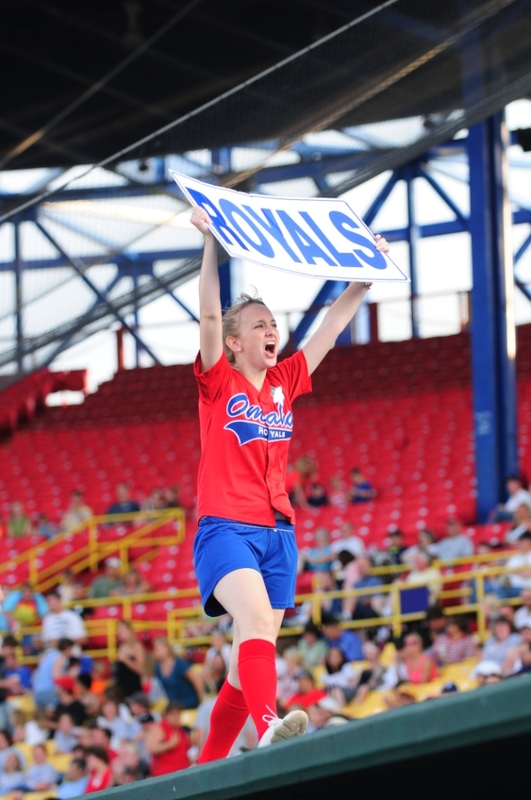 I refer frequently to my job with the Omaha Royals, but it occurs to me that I’ve never really outlined what I actually DO there. So, here’s that. Today is the pregame duties; Part II will be the in-game and post-game stuff. Arrive and head toward the “promo room.” That’s where we keep all of our stuff – the t-shirt gun, shirts, etc. For security purposes, I will not say where this room is. The promo room is quite small, so right away I start carrying stuff outside to make some space in the room. “Stuff” includes 4 buckets of bean bags, each of which has to weigh 30 or more pounds. Carrying those is like the only exercise I ever get. Anyway, I start carrying those and a few other everyday objects outside before doing anything else. “Outside” means the camera wells next to each dugout. In Omaha, the visitors are on the 1st base side so the Royals are on 3rd. 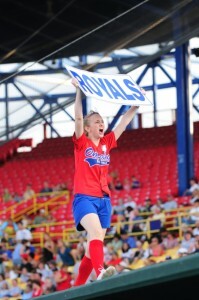 Because I’m a Royals fan, I strongly prefer 3rd base, but each side has its own perks. For example, girls on the 1st base side get to spend 2 innings in the air-conditioned press box with contestants for two different promotions. Roll T-shirts. We throw/shoot shirts out twice per night, and the number varies based on expected crowd size. More people = more shirts. Gather prizes for all contests. Winners get all kinds of stuff, depending on who sponsors each contest. 2nd place contestants all get a pair of GA tickets for an upcoming game. Assign girls to either 3rd or 1st base. Address any out-of-the-ordinary scheduling issues. If we have a guest entertainer, like BirdZerk, the Zooperstars, the Bucket Boys or anyone else, our usual schedule gets all shaken up. A note: Each game is mapped out on a spreadsheet. Every staff member has this itinerary every game, and it serves as that night’s Bible, basically. Everything we do is planned out based on innings, and the staff moves around the stadium according to the schedule. If you ever see me hunched over a clipboard looking all concerned, that’s probably what I’m looking at. Roam around the stands, seeking willing contestants. This has always been the hardest part of the job for me, because it involves frequent rejections, and that’s hard to handle for shy folks such as myself. (No, seriously. I’m quite shy.) We have to guess whether a given fan/couple/group would be willing to subject themselves to potential embarrassment in the pursuit of sweet prizes and great memories. Sometimes this process runs right up until the start of the game, which is stressful. Because signing people up is such a hectic, failure-filled process, we LOVE volunteers. So if you’re at a game and want to sign up for a contest, come early and come find us. We’ll love you for it! Make sure young pre-game “helpers” are where they need to be. While we’re in the process of signing up people for the whole game, we also have some pre-game promotions to handle. Every day, we get two children to help us keep track of Royals Ks by hanging up signs in Section P after every strikeout. These kids get to be on the video board, but to make that happen, we take them to the 3rd base camera well so they can smile and wave at the camera in the sweet free t-shirts we give them. This was our kid of the game one day in May. Another pre-game “helper” is the Kid of the Game. I LOVE signing up kids for this, because it’s often the most adorable part of the day. 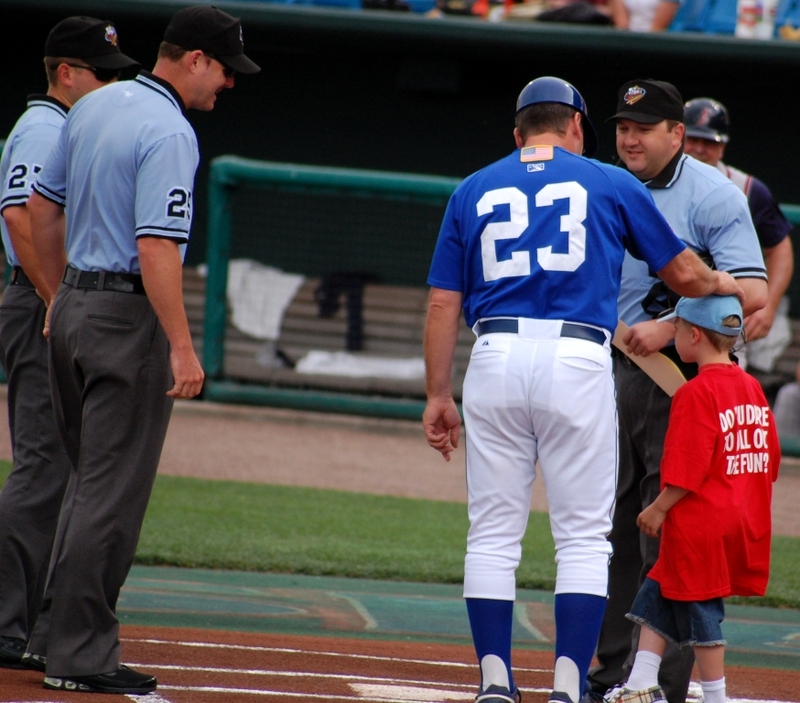 The child we select goes out on the field with manager Mike Jirschele to take the lineup card to the umpires. The kid gets to be by the dugout while the players are prepping their bats and just milling around, so it’s fun to see the wide-eyed kids admiring their favorites from close up. That’s when moments like this happen! I think that’s it for the pre-game. Check back soon for the in-game stuff we do! Thanks for the insight into your job. Vastly more exciting than my own and something I’ve wondered about while attending games over the years.